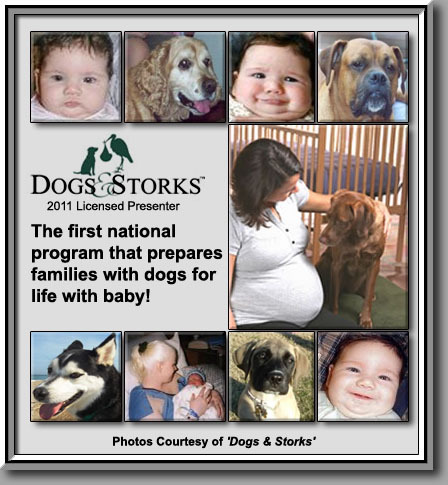 Dogs & Storks™ provides expecting families with practical education and support during pregnancy, to increase safety and decrease concerns many new parents have about the family dog. Once the new baby enters the home and sleep deprivation adds to the many concerns about the family dog, many families feel helpless and overwhelmed. Too many dogs lose their homes during these times. For more information about the Dogs & Storks program visit www.dogsandstorks.com. View the Family Paws Parent Education video – Dog & Baby Resources for Parents. For information on upcoming workshops or to schedule a private Dogs and Storks consultation contact Hedda directly at heddagarland@schoolofdogs.com.